A unicorn and a pegasus, two inseparable best friends, strive to make their world of Galloping Grove a better place. Following the success of the Pokémon series of Japan in the late 1990s, various studios started making shows about creatures with special abilities to rival it. We got Foster's Home For Imaginary Friends, Monster Rancher, Digimon (and its many spiritual successors), and the Lilo & Stich series. As the Pokémon series is still relevant today (not to mention that Pikachu has a film which will be released later this year), some studio working for Nick probably decided to make a show as an answer to it. 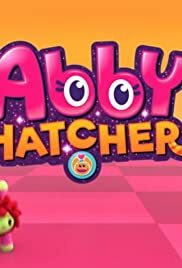 Thus we have this show Abby Hatcher which happens to be made by the same people behind the successful Paw Patrol series. The show Abby Hatcher centers on the eponymous character who's tasks involve rescuing unique creatures called Fuzzlies whenever they're in distress. When I say the Fuzzlies are unique creatures, I mean we have a blue rabbit that could fly, a raspberry with long flexible arms, two felines with extendable bodies, etc. At a glance, the show looks a little feminine in style. But because the characters are balanced, I'm sure both boys and girls would appreciate it.